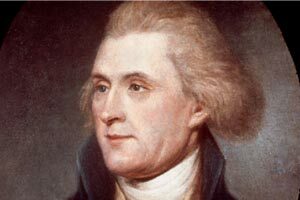 Born in Virginia in 1743, Thomas Jefferson early on displayed a lively curiosity, a gift with words and a passionate belief in liberty. Keenly attuned to the intellectual currents of the day, he eagerly embraced the Enlightenment with its emphasis on reason over revelation and absorbed the tenets of Whig political theory that stressed the dangers of concentrated power and the importance of restraints on government. Convinced that the state had no business coercing religious conformity, Jefferson made defense of liberty the hallmark of his career. In 1776, he wrote the Declaration of Independence. The following year, he introduced a Bill Concerning Religious Freedom to the Virginia Legislature. In 1787, he urged his friend and colleague James Madison to amend the Constitution to include a written guarantee of religious liberty. Jefferson's campaign to end state support of religion fueled doubts about his personal religious beliefs. These doubts, which had swirled around him for years, emerged as a critical issue in the bitter presidential campaign of 1800. His Federalist opponents vilified him as an atheist and libertine. Jefferson fumed at the harassment coming from what he referred to as an "irritable tribe of priests" and even compared his persecution at the hands of the New England clergy to the crucifixion of Christ. Jefferson won the election, beating his friend and rival John Adams. On New Year's Day 1802, he welcomed to the White House the dissident Baptist preacher John Leland. That same day, Jefferson replied to a letter sent by Baptists in Danbury, Conn., who chafed under the authority of the established Congregational Church. In his reply Jefferson invoked the famous metaphor of a "wall of separation" between church and state. Like other Founding Fathers, Jefferson was considered a Deist, subscribing to the liberal religious strand of Deism that values reason over revelation and rejects traditional Christian doctrines, including the Virgin Birth, original sin and the resurrection of Jesus. While he rejected orthodoxy, Jefferson was nevertheless a religious man. Influenced by the British Unitarian Joseph Priestley, Jefferson set his prodigious intellect and energy on the historical figure at the center of the Christian faith: Jesus of Nazareth. Jefferson became convinced that Jesus' message had been obscured and corrupted by the apostle Paul, the Gospel writers and Protestant reformers. While president, Jefferson took a razor to the Bible, cutting out portions of the Gospels that involved miracles and retaining his parables and ethical teachings. The resulting volume, The Philosophy of Jesus of Nazareth, affirmed his conviction that Jesus was not divine, but "a Teacher of Common Sense," primarily concerned with morality and ethical conduct. Years later, Jefferson drew from the New Testaments in Greek, Latin, French and English to create The Life and Morals of Jesus, commonly known as the "Jefferson Bible." Based on this work, he acknowledged to a close friend, "I am a real Christian, that is to say, a disciple of the doctrines of Jesus." For Jefferson, it was the moral message of Jesus, not claims of his birth, death and resurrection, that lay at the center of the Christian faith.